As part of The Gem Project's educational panel and discussion series (EduSocial), they will host their second mini writers' summit. The mini summit will give insight on how to establish successful careers in the writing and publishing industries. An event sponsored by Wix Lounge, The Gem Project will welcome guests with warm music, light hor' doeuvres, goodie bags and knowledge from industry experts to help launch their careers. How can you make a business with your calling? A keynote address by best-selling artist, Mr. Anthony Rodriguez of AR Music Group Firm, will be sure to inspire. You'll learn about about his journey and the ability to tranform passion into profit. In our case, aspiring and seasoned publishers or writers will learn how to push themselves forward, prior to the panel discussion. The educational panel discussion will bring out editors, publishers and authors to talk about their experiences and discuss key issues within writing and publishing industries. In our last mini summit, we had TV journalist and writer Ayesha K. Faines; Slim Jackson, editor of Singleblackmale.org; Freelance Writer, Meghan Reid; Beauty Director of ESSENCE magazine Corynne Corbett; and social-media manager and founder of Michelle O' Brunch, Chana Ewing. What is The Gem Project? How are these events helping? The Gem Project is a nonprofit organization that educates school-age youth and young adults about issues that affect them and their communities. Through the use of innovative and enriching activities, The Gem Project helps strengthen skills of leadership and community organizing. We were recently made Forbes' 30 under 30 in Education. Besides running The Gem Project, Ebokosia is a contributor to numerous media outlets on the topics of leadership, empowerment, education, feminism and business. Ebokosia's work can be seen online on Black Enterprise, Forbes and Glass Heel. She has spoken and/or led programs at Rutgers University, New Jersey Institute of Technology, AOL Patch NY ( Ignite Your Ambition by The White House Project & NY TECH Women), Montclair YMCA ( Teen Travel Camp), United Way of Essex and West Hudson ( Stop Shootin’ Summer Youth and Entrepreneurship Program) and more. Located steps from Union Square, the Wix Lounge is a completely free co-working and event space for creative professionals. Grab your laptop, pop into the Lounge and enjoy a productive workday, great networking opportunities, and amazing events. Active since 2010, the Wix Lounge is run by Wix.com, a free drag-and-drop web publishing platform providing user friendly tools for building beautiful, easy-to-make desktop, mobile, and Facebook sites. The Wix Lounge provides free support to Wix.com users, giving them help and advice for making the ideal website. 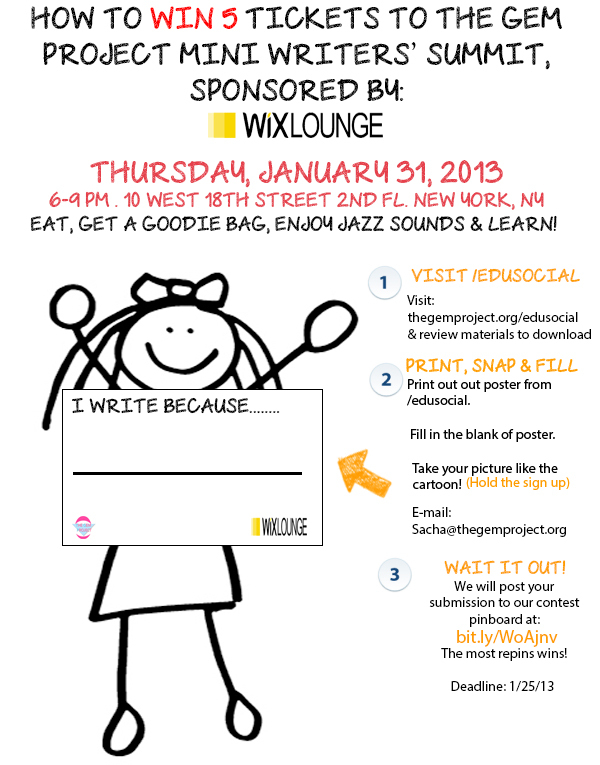 To learn more about the Wix Lounge, please visit www.wixlounge.com. 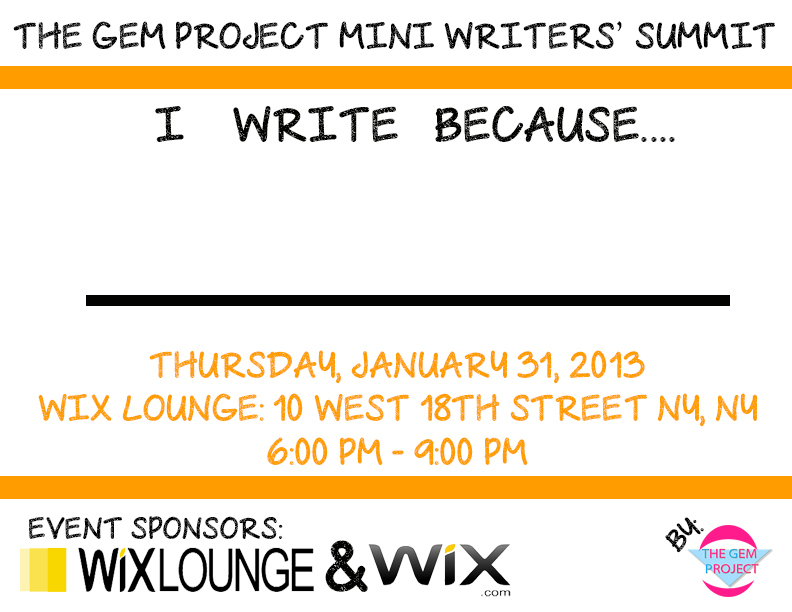 Have questions about The Gem Project Mini Writers' Summit Event? Contact The Gem Project, Inc.
We're creating the next generation of change agents! To improve high school to college graduation rates of marginalized populations, through service-learning initiatives with a social justice approach, which focuses on underserved communities.